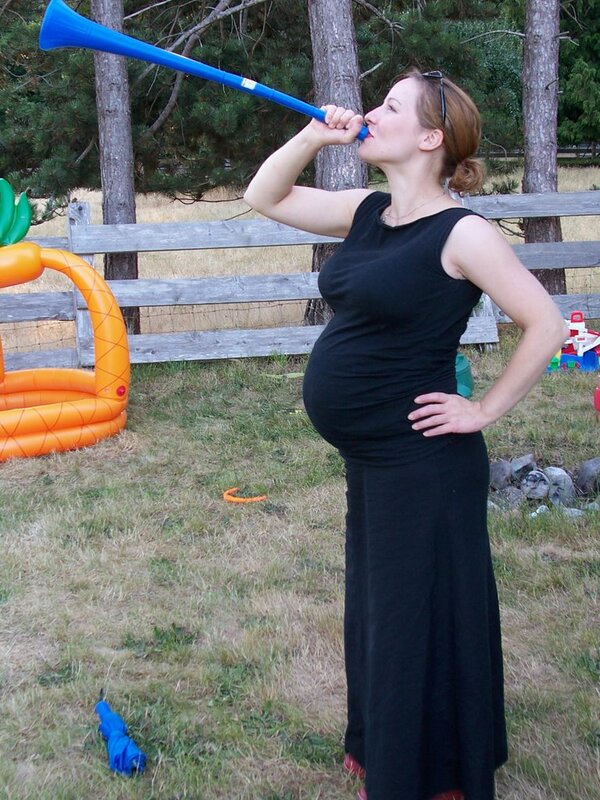 I bet Tannis doesn't wish she is about to give birth to a three and a half year old! True enough. Maybe a newborn-sized post-toddler? Wishful thinking. Perhaps this time around I'll be all over the baby stage and won't want it to pass as quickly as possible. Probably more wishful thinking. In some ways Tannis doesn't wish she was about to give birth at all! Then again, the sooner the better by now so as to avoid the child being born with full facial hair and a deep voice. Assuming some of my genes being present in this new kid, the odds of "full facial hair" at any point is extremely unlikely. I bet he'll have lovely, long fingernails but no hair to speak of. Glad to hear you are both still doing well in these late days of pregnancy! Sounds like you make a great team! We're eagerly awaiting the news! Right back at you Ang, gorgeous woman - both when you were pregnant and now that you're able bodied! 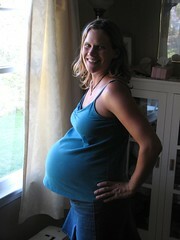 ...and the photographic proof that Ang was also a hot (and preggo) mama last summer. I'm amazed by your optimism T. I think I went into full out mourning during those final days, weeks, months. Total crab. Ang, I think my mourning may kick in once the outrageous, firm belly gives way to outrageous skin sags and bags under the eyes. That's why babies are supposed to be cute - nobody even looks at the new mama for a few weeks at least.